Affordable Casbah RSVP set includes the petite A1 matte softwhite 80 lb envelope and 100% cotton rsvp card. RSVP card in same Crane Lettra cardstock measures 5x3.5 inches. Papers for both the RSVP card and envelope are made in the USA. If you print, the rsvp card comes 4 to a sheet, so you print and cut. If we print, we cut to 5x3.5 inches. Templates for both parts comes with the kit. SOLD OUT! Discontinued. Festive and Fun Loving -- our Casbah eco + budget wedding invitations celebrate both the environment and the pocketbook. 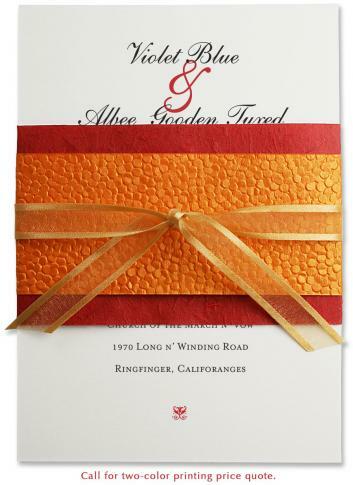 A double paper bellyband and gold ribbon dress this all cotton, all eco luxury wedding card in bright orange handmade paper and red sugarcane paper. Crane lettra cardstock (100% cotton, used on all the fancy letterpress invites). LARGE FORMAT: A8 size. Your guests will be sure you spent a fortune! Bright and sassy and fashionably frugal. Saving so much that you're thinking of having us print for you? We can print your invites in chocolate brown, eggplant purple, charcoal grey, deep burgundy. High on the Wow factor. DIY Wrapped Invitation with double bellyband of beautiful purple treefree mulberry paper. The invitation and envelope are made in the US. This design works very well with modern wedding graphics, offering a very large canvas measuring 7 3/4 inches by 5 1/2 inches wide. (A8 size) ECO PAPER FACTS: 100% cotton cards, sugarcane red paper, and cotton handmade orange belly bands. Envelopes are 100% recycled, with 50% PCW. Colors: Softwhite, deep red and bright orange. Gluestick: For gluing bellyband and envelope liner.